Immigration to the United States may start picking up again. The U.S. is expected to have 56 percent more immigration in 2015 than was projected just two years ago — but less immigration than forecasted before the Great Recession in 2008. These data points come from the Census Bureau’s National Population Projections, released Wednesday. The main purpose of the report is to forecast total population growth (the report expects 416 million people in the U.S. by 2060). That means estimating births and deaths to get a natural rate of population change. But it also means making projections for net international migration — the total number of individuals coming to the U.S. who weren’t born here. And in 2015, the Census Bureau expects the U.S. to grow by about 1.24 million people from immigration alone. That’s up from the 2012 census projections for 2015, which had put the number at about 800,000. The 2014 and 2012 trends are far below what the census expected in 2008, before the U.S. economy entered the largest recession since the Great Depression. In 2008, net international migration for 2015 was projected to be about 1.4 million. Most strikingly, the 2008 report projected net international migration to grow linearly through 2050, eventually exceeding 2 million people per year. 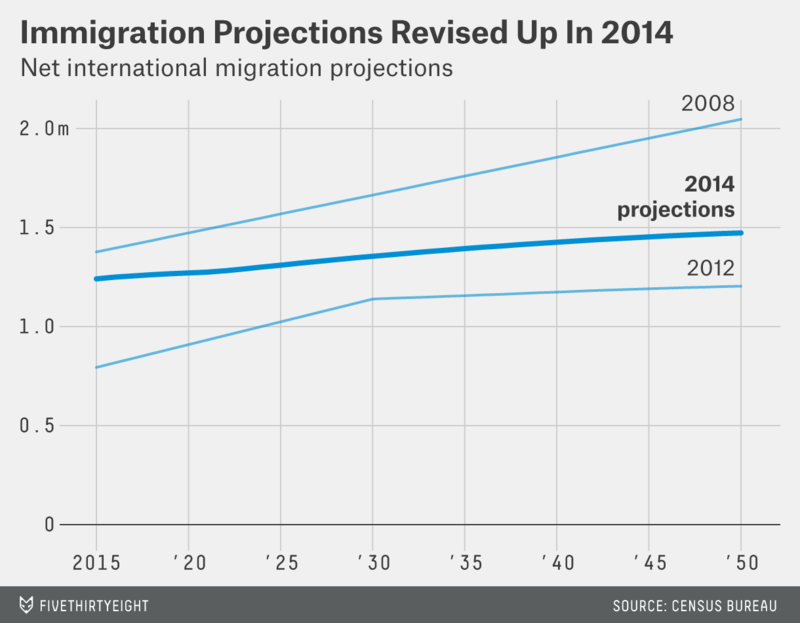 The 2014 projections are flatter, forecasting that immigration will level off in 2050 at just under 1.5 million. Immigration (and thus immigration forecasts) is highly cyclical. So, though the U.S. economy is on better economic footing now than six years ago, the future trend of U.S. economic growth has been revised much lower.